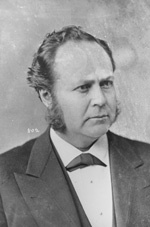 WINDOM, William, a Representative and a Senator from Minnesota; born in Belmont County, Ohio, on May 10, 1827; pursued an academic course at Martinsburg, Ohio; studied law; admitted to the bar in 1850 and commenced practice in Mount Vernon, Ohio; prosecuting attorney of Knox County in 1852; moved to Winona, Winona County, Minnesota Territory, in 1855; elected as a Republican to the Thirty-sixth and to the four succeeding Congresses (March 4, 1859-March 3, 1869); chairman, Committee on Indian Affairs (Thirty-eighth through Fortieth Congresses); appointed as a Republican to the United States Senate to fill the vacancy in the term ending March 3, 1871, caused by the death of Daniel S. Norton, and served from July 15, 1870, to January 22, 1871, when a successor was elected to complete the term; elected to the United States Senate in 1871; reelected in 1877 and served from March 4, 1871, to March 7, 1881, when he resigned to accept a Cabinet portfolio; appointed Secretary of the Treasury by President James Garfield and served from March 1881, until his resignation, effective November 1881, having been elected Senator; elected to the United States Senate on October 26, 1881, to fill the vacancy caused by his own resignation, and served from November 15, 1881, to March 3, 1883; unsuccessful candidate for reelection in 1883; chairman, Committee on Enrolled Bills (Forty-second Congress), Committee on Appropriations (Forty-fourth and Forty-fifth Congresses), Committee on Foreign Relations (Forty-seventh Congress); moved to New York City in 1883 and practiced law; appointed Secretary of the Treasury in the Cabinet of President Benjamin Harrison and served from March 1889, until his death in New York City on January 29, 1891; interment in Rock Creek Cemetery, Washington, D.C.
American National Biography; Dictionary of American Biography; Fischer, Roger A. William Windom: Cartoon Centerfold, 1881-91. Minnesota History 51 (Fall 1988): 99-109; Salisbury, Robert S. William Windom, Apostle of Positive Government. Lanham, Md. : University Press of America, 1993.